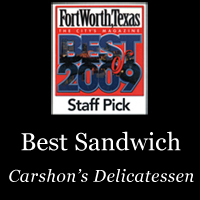 Carshon's Deli is one of the oldest restaurants in Fort Worth, Texas, and certainly is the oldest deli in Fort Worth. It was established in 1928 by David Carshon, a Jewish immigrant. Carshon's is a kosher style deli today—and the only one in Fort Worth. Carshon's began in downtown Fort Worth in partnership with Chicotsky's Meat Market at 1010 Houston Street. Eventually, Carshon's moved to W. Berry Street near TCU and remained there during the '50s and '60s. It has been at this present location since the early '70s. Carshon's also has been family-owned and operated since it began in 1928. The store features New York style sandwiches and side orders, other deli products and terrific desserts. The hours of operation are 9:00 a.m. to 3:00 p.m., and the dining room closes at 2:30 p.m. Monday through Saturday. We are located at 3133 Cleburne Rd, Fort Worth, Texas 76110, and we can be reached at 817.923.1907 or via e-mail. © 2008-2019, Carshon's Deli. All rights reserved.